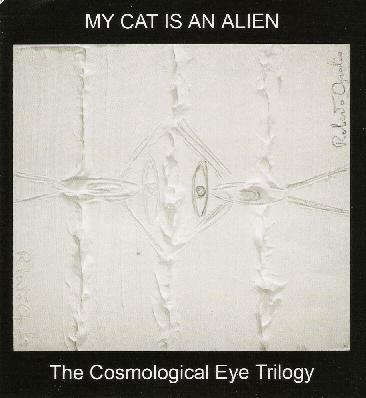 My Cat Is An Alien - "The Cosmological Eye Trilogy"
My Cat is an Alien are the brothers Maurzio and Roberto (no overdubs/ no outtakes) Opalio from Torino Italy, who've been releasing cool cutting edge experimental records and CD's since '98. THE COSMOLOGICAL EYE TRILOGY is a 3-CD set of great music and really cool packaging. A perfect gift for that friend who's taste is so particular, special, snobbish etc. A CD set that won't be in the cheap bins in three years with the Coldplay. These guys are taking underground music where it should be taken, further underground into the realm of mystery and magic and out into space, a place where music means something and is made for the right reasons. Oh My God, I can't believe it, ORIGINAL MUSIC! Let's face it, trying to sound exactly like your favorite 70's Prog band is not very aurally innovative. DISC 1 - THE COSMOLOGICAL EYE INTRODUCTION 14:01 - These are all live recordings, no overdubs... glass tinkling and clanking, a constant oscillator twitter, has a nice full sound. Maurizio on voice, toy mic, electric alien guitar drone, cosmic cymbals, metal sticks and Roberto on voice, toy mics, electric space guitar, and Plutonian percussions. Recorded July 9th, 2004 at the Space Room, no overdubs/ no outtakes. Fake bird sounds, some distant vocals that recall Jandek. He's carrying on about something. Basically very nice meditative droney spacey live improvisation. You can crank it up! INTO THE SLEEPING BEAUTY GALAXY 55:19 - Slow journey to the center of your mind. The gist of all this seems to be a music tribute/live recording influenced by the discovery of M64, the Sleeping Beauty Galaxy in 1779 by Edward Pigott. More deep space meditation and cymbals. Roberto plays the electric prepared astral guitar and Maurizio plays the electric alien guitar, amongst other things. Nice drones... you could really get out of your head with this stuff. I'm not sure what it all has to do with alien cats tho? Maybe it's all about the Photon Belt we're supposed to enter in 2012 that takes us to the 5th Dimension? Maybe not? Some quality Dronage goin' on here. I reckon this is what everyone is calling "difficult" music but to me it's much easier than every rock band I've heard for the last 10 years, every generic pop punk band on Conan or all the Hawkwind clones that are definitely not aurally innovative. Just good ol music for music's sake or saki?. Cutting out the music biz idiots that always get it wrong. Nice tones... we're almost to the center of Uranus. Sorry, couldn't resist... glad to hear the Italians make some music that's not 1974 sounding bombastic arena rock... alot to think about in 55 minutes and 19 seconds. The reason I like long songs, long bussrides etc... oh, by the way, I dreamed last night that all these ex-major league baseball players from the 30's and 40's got together for a reunion where they were all acting like they were mentally retarded and excitedly talking and laughing with each other with their baseball uniforms on! Very strange. Anyway this music is very nice. Tapping messages from the other side? At 43:50 and it just keeps getting better and better. How 'bout that for your "difficult" music!!?! DISC 2 - THE HELIX NEBULA 7:59 - Immediate burbling from Maurizio (helix cymbals and percussions) and Roberto Opalio (electric nebulae gtr drone, astral percussions). And since it's live you can hear noises in the background which is cool as far as I'm concerned. I'll take substance over fashion anyday! Lots of percussion in this one along with the persistent gurgling pulse. It gets loud, intense, bombastic... the Italians have to be bombastic, even with meditative music. Wow, what a cool track! INTO THE SOMBRERO GALAXY 40:03 - It starts very quiet and still... 4:57 - some intense deep spaceness... 9:09 - beautiful keyboard tone, space noises, extremely cool... soaring through the ether... talkin' to the DMT creatures... floating just under the ceiling... falling off a cliff and being saved by the elves... perfect music for meditation or magic... 24:50 - shifts into higher gear... the wee people are chattering madly... 29:34 - angelic cymbals along with the monotonous grind of the electric nebulae guitar drone. The Aliens Have Landed!!! Hip, Hip, Hooray!!!! Throw off your Dubya shackles, Glory Be God, the whole planet is one eternal Woodstock Nation in the mud and rain and piss. We're on the other side now! What to do with total freedom?!!!?? THE TRIFFID NEBULA 21:33 - This is all recorded in Torino Italy where the Winter Olympics are happening as I write this. Again, very nice music, similar in places to the Tangerine Dream Alpha Centauri album. Literal recording of deep space travel but recordings of the human mind. I have NASA recordings from deep space and they sound just like this. DISC 3 - INTO THE WHIRLPOOL GALAXY 33:03 - Pulsating drone... I can't tell if it's the electric alien guitar or the electric astral guitar. Cool whistlin' noises, music made for sincere, meaningful reasons, not music made for corporations or lowest common denominator that is most record labels. THE ORION NEBULA 34:52 - More deep space coolness. There are no words to describe this music. This has a vocal, far away metallic, pre-recorded? This is a great release. It makes the entire genre of underground rock music seem old fashioned and irrelevent. This music is therapeutic, not made to sell beer or appeal to someone who got into alternative music two years ago when they were a Freshman... 30:50 - gets quiet... yes, the aliens have landed. Oh my God, I'm the Alien!!!!!!!!!! For more information you can visit the My Cat Is An Alien web site at: http://www.mycatisanalien.com. Visit the Last Visible Dog web site at: http://www.lastvisibledog.com.